Organizations across all industries are under great pressure to quickly adapt to new market conditions. They need to transform their approach to systems engineering and software development to deliver new features and offerings faster and respond to feedback — continuously. Most of them have been experimenting with lean and agile principles to reach that goal. But many are still struggling to apply those best practices for small, co-located teams, much less get the full benefits at enterprise scale. We’ve been paying attention and are focused on beefing up our approach and solution for adopting agility at scale. Here are some of the highlights available in Collaborative Lifecycle Management 6.0.5 to help you as you get started or continue to drive this kind of transformation across your enterprise. If you’re not adopting the Scaled Agile Framework® (SAFe®) methodology, please don’t stop reading, because there are things for you here regardless of the processes in place! We start with SAFe because there are some big changes – many that also help enterprises using a mixture of methodologies. It’s true, the most exciting announcement for us is the support for SAFe 4.5, which includes beta templates for Rational Team Concert (RTC), Rational DOORS Next Generation (RDNG), Rational Quality Manager (RQM), as well as an updated set of reports with a new packaging structure to make it easier for all to consume, even if your organization is not adopting SAFe itself. If you don’t want to use SAFe or don’t care, the templates can still help you set up an appropriate – and tremendously valuable – tooling infrastructure to help you get a grip on business alignment and the orchestration of delivery across teams. Following this lead, we have delivered a set of beta templates to support each of the configurations through sets of templates for RTC, RDNG, RQM and CLM itself, which allows you to stand up a complete, cross-domain SAFe 4.5 tooling environment with the click of a button! Take a look at the SAFe “big picture” below. 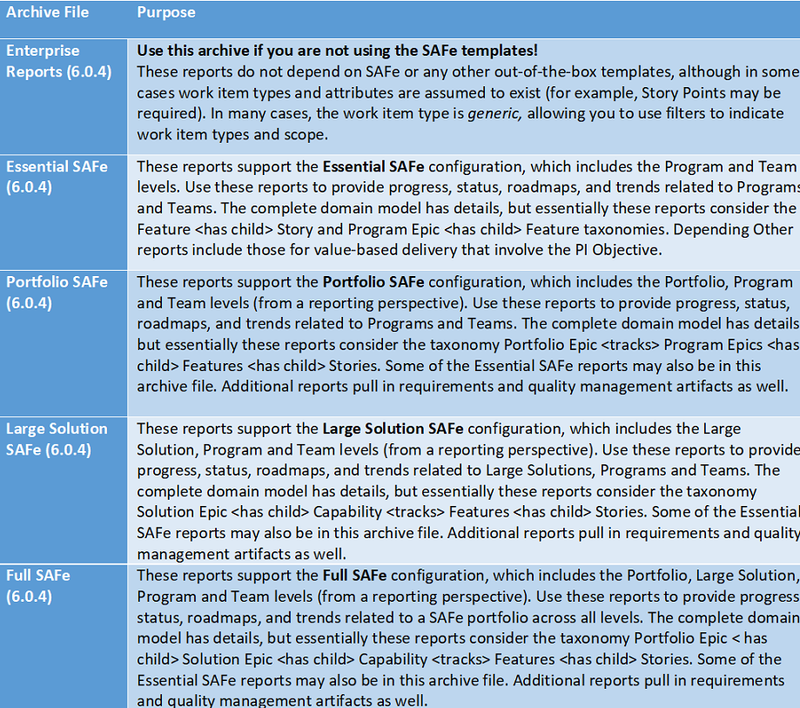 Notice that the Full, Large Solution and Portfolio templates don’t touch the Program/Team level. That’s because, in your organization, you will have multiple instances of the Essential environment connected to a single environment at the top to support your Portfolio and/or Large Solution activities. By providing you with templates for each of the configurations, we enable you to set up a tooling infrastructure gradually. As your needs grow, the tooling can grow with you. Most exciting is the ability to establish a cross-domain environment for change, requirements and quality management if that’s what you need – for any SAFe configuration. The basic scaled agile reports haven’t really changed for SAFe 4.5 except that the domain models are slightly different to accommodate the Large Solution level updates. Work Item types are a different, that kind of thing. 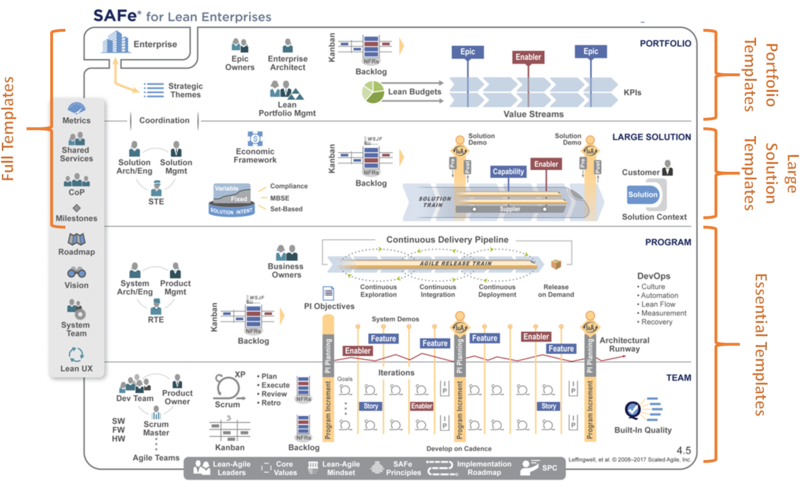 The updated domain models are already published, go take a look at them here: Enterprise Scaled Agile Domain Models. So why the (6.0.4) label? That’s because we actually delivered beta support for SAFe 4.5 back in August, so there are some customers not yet on the 6.0.5 release that may still want to adopt SAFe 4.5. We want everyone to be able to take advantage of reporting that supports a lean transformation. Rest assured, we are developing and publishing reports as fast as we can and we are working on some of the more complicated reports that everyone really wants. Our objective is to provide the most basic reports first so you have something to start with. We will publish updates on the SAFe Reporting site as soon as we have new stuff – and I will blog about any reports that are just too important for you to miss! All of the scaled agile reports can be copied or edited, so I encourage you to try your hand at customizing these reports for your specific organizational needs. Okay, we’ve talked about templates, reports and domain models. But what about new functionality? For enterprise scaled agile support, requirements and quality management are important for many, but everyone must have awesome tracking, planning and reporting capabilities. From a tracking and planning perspective, you must go check out the latest information on the new Quick Planner! A ton of improvements have been made specifically to help agile teams plan better, easier, faster and with additional flexibility. Read more about it in the What’s new in IBM Rational Team Concert 6.0.5 blog. In the Reporting space, we are doing a ton of work to focus on consistency and speed. Details about updates in this area can be found in the What’s new in Rational Publishing Engine 6.0.5 and Jazz Reporting Service 6.0.5 blog. I would be remiss if I didn’t point out one more cool thing for everyone – Interactive Previews. What?!! Really, interactive videos that allow you to watch and listen while pointing and clicking yourself in a read-only tooling environment. We just introduced this so expect to see more videos as we roll them out. Go try it at https://jazz.net/previews, and please let us know what you think. As always, I love to get your feedback on anything you’ve read here. Happy to help you get started or point you in the right direction. And please visit our SAFe landing page on jazz.net for all things “SAFe”! As always, we are here for you so don’t hesitate to reach out.